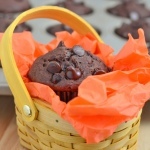 Double Chocolate Chip Muffins made a little healthier! The healthy recipe swaps are less fat, less sugar, but not less flavor. This is a great recipe to bake and give during the holiday season. Combine all ingredients in a mixer. Pour mixture into muffin cups and top with more chocolate chips (optional). Bake for 20 minutes or until a toothpick inserted comes out clean.